I must not wear any clothes, underwear, nail polish, jewelry or shoes that I have worn within the past year for 50 days. My wardrobe before the attack when everything was still peaceful and quiet. Trying to get a hold on my stored basement clothes. Bye bye Levi, Commes Des Garcons, Acne, American Vintage, beloved Munderingskompagniet leather pants and Diane Von Furstenberg skirt. And yes it is my new business cardigan from Vibskov, that was supposed to be my grown-up fashionista Copenhagen Fashion Summit piece, lying there in the box crying (no wait, that was me). I own 43 pairs of shoes. 6,5 Converse, 6 identical high boots and 21 pairs of my shoes I haven't worn for 1 year! Luckily I found a little treasure in the darkest of my despair. 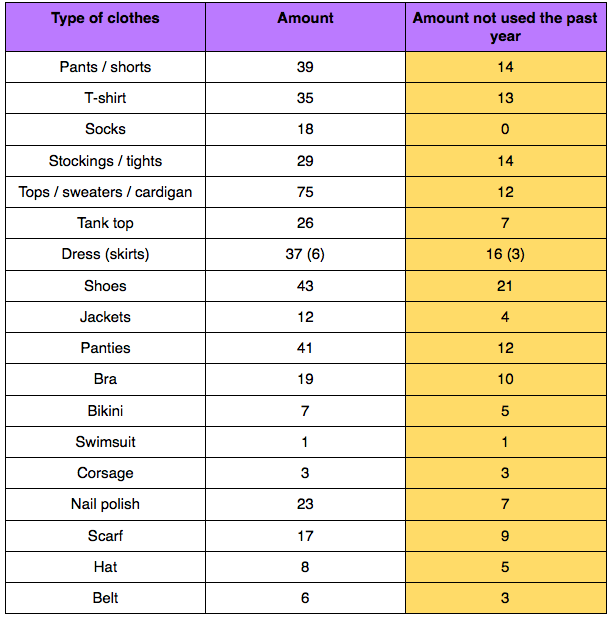 The yellow column shows the amount of clothes left in my wardrobe. The clothes and shoes has to be worn in public for a minimum of 5 hours. When wearing some of the shoes (the really high ones) I am allowed to bring extra shoes. Every piece must be worn at least once. * Sportclothes, night clothes and my size zero skinny-jeans are excluded from the rules.